Today’s guest blogger is Richard Johnston, cofounder of Gryphon Stringed Instruments. There are lots of different sizes of ukuleles, from the tiny soprano to the almost-guitar-sized baritone, but the concert uke is one of the most popular with today’s players. It’s small enough to deliver the bright “jumping flea” tones of soprano ukes, but the slightly larger body and longer string scale delivers more volume. And since the frets are further apart, it’s easier for guitar players to adapt to the neck. C. F. Martin first popularized the concert size ukulele, but that was only after the mainland’s premier uke manufacturer had tried to market a more unusual version of its hot-selling new instrument. 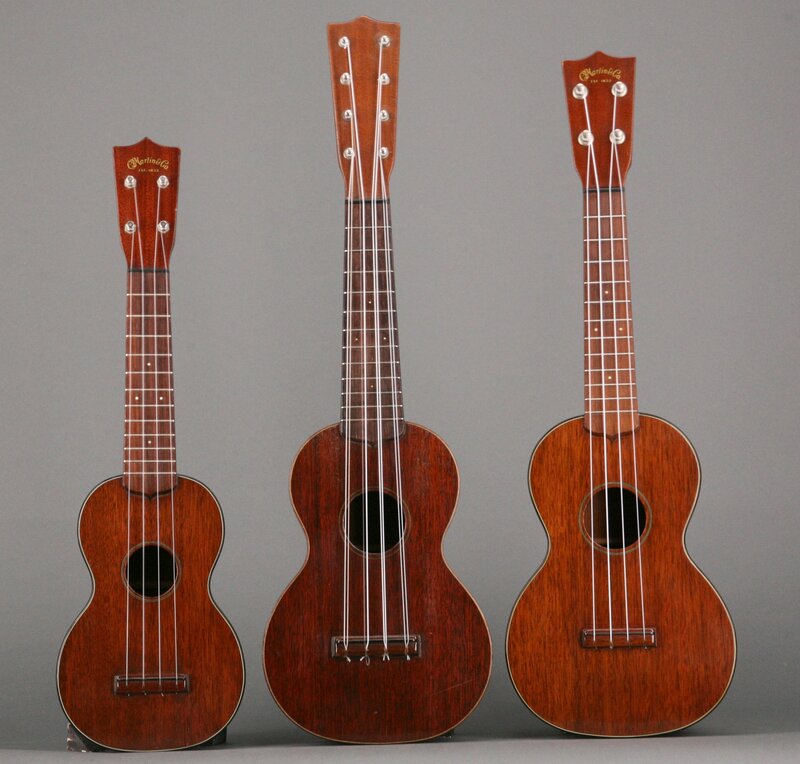 Shown here are three Martin mahogany ukes: On the left is a Style 1 soprano from the late 1940s; in the middle is a Style 1 taropatch from the mid-1920s; and on the right is Martin’s concert model, also from the late ’40s. Just a few months after Martin introduced its line of soprano ukes in 1916, the company offered a larger model with eight strings, called the taropatch. The strings were tuned in pairs, much like a mandolin, but in standard ukulele tuning and of course with gut strings. Martin called them “taro-patch fiddles,” a name linked to the romantic notion that Hawaiians took them to the fields when harvesting taro. The bigger body and twice as many strings made the taropatch a real powerhouse when compared to a typical soprano uke. The problem, however, was that with its friction pegs and all those extra strings, the taropatch was difficult to tune, and also much more expensive. Ukes were supposed to be easy-to-play, carefree instruments, but taropatch players often found themselves spending more time tuning than playing. Probably the most noteworthy exception was Buster Keaton, who owned and played a Martin taropatch and even ordered one with his name on the headstock. But even a movie star like Keaton wasn’t enough to boost the popularity of the taropatch—it was the least popular model in Martin’s ukulele line. Before too long, the company was offering a 4-string version, and in 1924 this new uke variant, called the Concert, appeared in Martin’s catalog described as “a large ukulele with a tone of great carrying power.” Of course Martin didn’t stop there—it offered tenor ukes four years later, but the concert uke was the first “large” ukulele, although it certainly doesn’t seem large today! By 1931, the Great Depression had put an end to Martin’s already slow taropatch sales and they were dropped from the catalog. The Style 1 Concert, however, survived and went on to become an important member of Martin’s more limited post-World War II lineup. The concert model appeared in Martin’s catalogs until 1965. Compared to soprano or even tenor models, however, they are hard to find, and today a Martin concert uke like the one shown here sells for about twice what the equivalent soprano model would bring.